It was just over a year ago that we first caught wind of Android Wear. At the same time, we were introduced to the G Watch, which would be the first Wear device—released alongside the Samsung Gear Live—to be sold to the general public. Now, with the addition of the G Watch Urbane and a permanent price drop for the G Watch R, the original G Watch is headed out of the Google Store. There was no telling exactly when this would happen, but it is no surprise that it comes now. 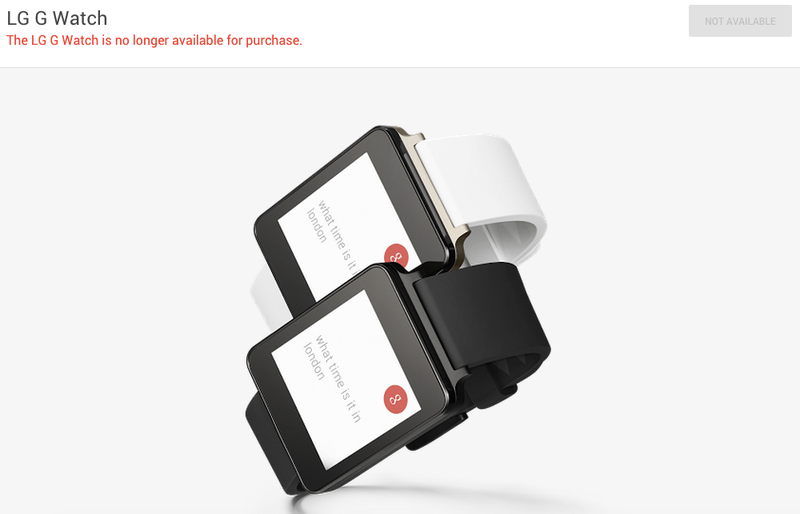 First of all, there is just a lot of LG in the Android Wear section of the Google Store right now. Likewise, with an interest in advancing the platform, Google might want to push people towards the newest and most capable devices. We've also seen a lot of discounts on the watch, a sure sign that retailers are trying to get rid of it. I picked one up rather recently and while its weaknesses are obvious, it does the basics pretty darn well. And compared to some of the best in class, the G Watch's battery lasts a very long time. You can't blame Google for being ready to move on, though.